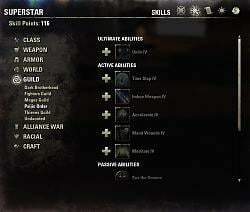 This is a patch to bring SuperStar in line with the Summerset/Wolfhunter (#100024) patches. Please visit the actual add-on site >> here << for the description, and a 25 minute demonstration video by the author, Ayantir. 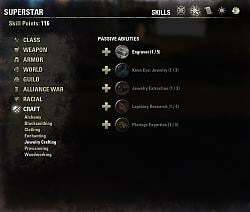 With the revamp to the ZO_Skills system, a lot of functionality has changed (for the better), and SuperStar should probably be re-written from the ground up. 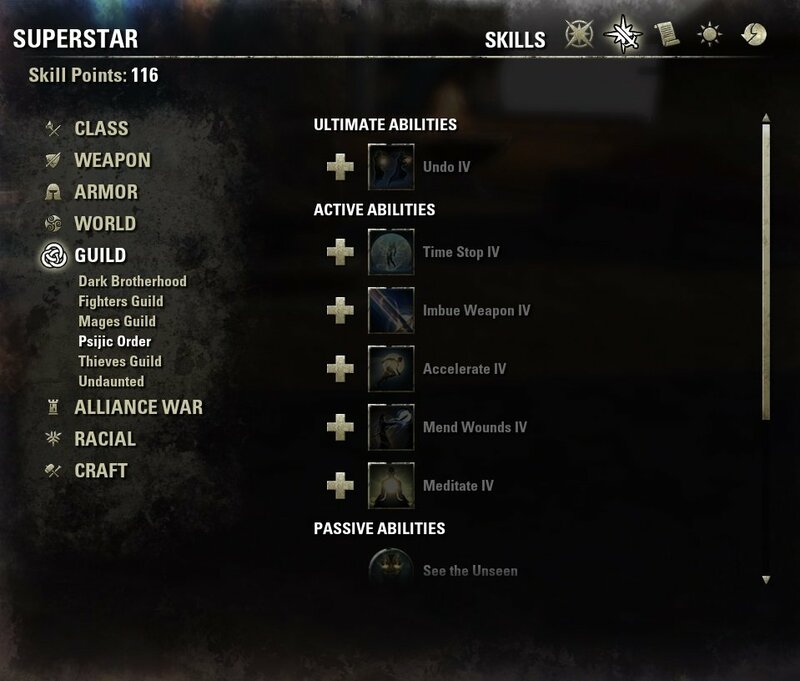 Added new guild skill line "Psijic Order". Added new tradeskill skill line "Jewelry Crafting". Changed the skill revision to "3" from "2", and added functionality to try to update older favorites to reflect the new skill changes. * Older favorites may not update. More testing is required. The update makes a copy of the old favorite, so your saves should not be overwritten. I play on an "en" client. I've tested as much as I could on the "fr" client. A major difference I noticed is the Werewolf line "Loup-garou" seems to have changed places in the new update. This might cause issues I didn't anticipate. Please send me feedback if something is not functioning for you. Also, I did the best I could with translations. I welcome others to help out with improvements. I hope these changes get SuperStar back in working order for those of you that enjoy the addon. If this update is successful and the interest is there, I will consider working on the addon further. - Corrected tooltips for skill morphs. - Corrected auto-granted skills counting incorrectly. - Corrected a tooltip issue for class and racial skills different from the player. Please let me know if the issue persists. Thank you for all the feedback, and my apologies for the rocky start. Known Issue: The tooltips for classes/races different from the player will show red text due to the player not meeting the proper rank to unlock the skill. I will try to address this in a future patch. - Added new guild skill line "Psijic Order". 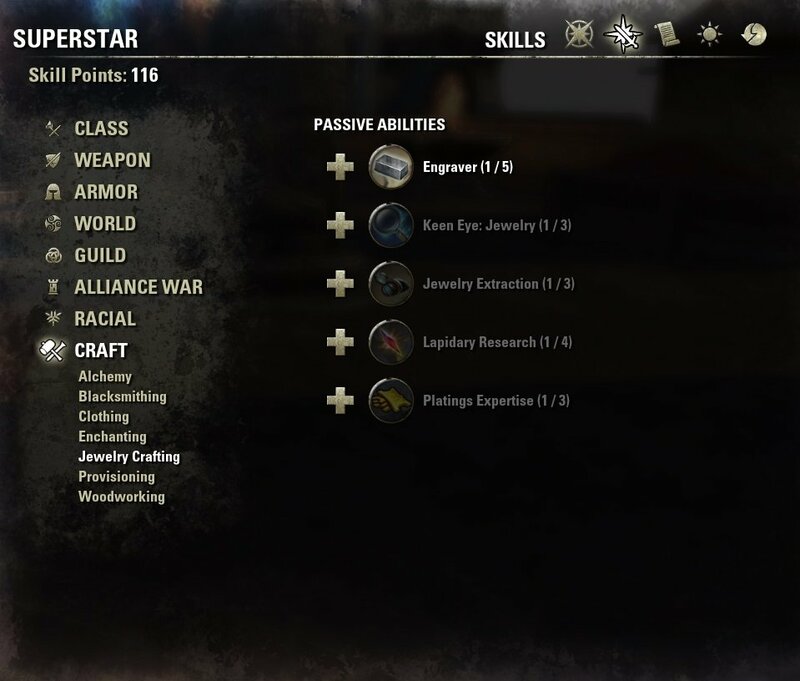 - Added new tradeskill skill line "Jewelry Crafting". - Bumped skill revision due to addition of new skill lines, and previous lines switching places. @SammiSakura Sorry Sammi, but I am unable to reproduce this at the moment. I saw another person post it on the main SuperStar forums, but the line numbers in both of your errors seem off from where they should be. 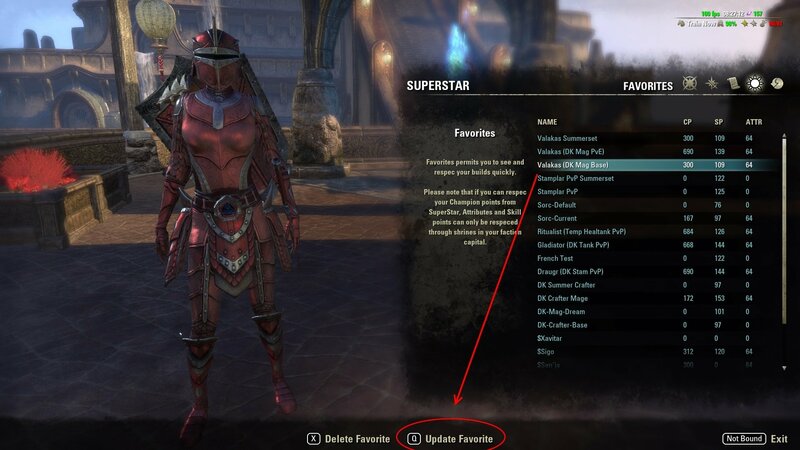 The only suggestion I have for now is please try re-installing the SuperStar - Summerset 4.1.4 patch. I'll keep trying to reproduce it. Are you on an English ("en") client, or is it "fr", "de", "jp"? Sorry I can't get it working sooner for you! Last edited by SammiSakura : 03/16/19 at 04:41 PM. You are still experiencing the issue after installing the 4.1.4 patch I submitted yesterday? Please confirm you applied the latest patch and if you still have problems, could you please provide the client you're on, and the class/race you logged in on? Thanks. Last edited by SammiSakura : 03/15/19 at 12:43 PM. The interface seems to display still, however barswapping to reveal both skillbars no longer functions. It simply changes the only bar displayed to be whichever one you have out (front or back) rather than showing both. This then breaks the whole interface resulting in empty windows for every tab until a reloadui is performed. Everything is working now. Thanks for the speedy update! Please try the fix I just posted and let me know if you still experience issues. Thank you. Hi @Marazota. I logged in and did a few tests but did not experience any errors, and I verified the skill line functioned on my end. If your error persists, can you please confirm some additional information? 4) Does it error on other characters? 5) Any additional information you think is relevant? My first guess is the in-game skill manager wasn't available for some strange reason, but I will need more information. Would be nice to know what this add-on does. It's not in the description anywhere. Hi Dueydoodah, thank you for the feedback. While all the core files are contained here, this is technically not an add-on. This is a patch for an existing add-on to handle the Summerset update, because the original author was not available. The actual add-on and description can be found here: SuperStar - Character Builder. I know it is very obscure, but under the download button it does say "Patch for:" with a link to the original add-on. I'll meet you halfway and put a comment at the top of the description linking to the core. I removed your previous comment because it seemed malformed. I am quoting it here to retain the information, with a slight edit to wrap the hash you provided in CODE tags for wrapping purposes. My response was included in my previous post. Hello Marzota. Can you please provide more details to what you're trying to do? It'd help if you could tell me what skills were selected and the hash you had that is failing. If you're importing a build from prior to my patch, it is not 100% in converting. I mentioned that in the patch notes. I can try to help you get it converted and improve my conversion in the process if that is the case. If you created a new build and it is failing, this is definitely a concern. Please let me know what skills cause the fail, and what hash it gives you, so I can try to reproduce the error.